I used to have a manageable stash of vintage patterns. I’d collected them over many years, and only really bought ones that I absolutely loved. I used nearly all of them, and kept them in four small Ikea boxes, labeled by time period. Life was simple. But when people find out you are in the sewing pattern business, something funny happens. They start giving you their old patterns. Being a lover of all things vintage and sewing related, I treasured these gifts. Even though I know I’ll never make them all, I love the artwork and the inspiration. I’m not usually a hoarder, but I don’t mind saying that this is the one exception. However, the collection soon numbered in the hundreds. I still wanted to use them occasionally, or at least be able to look through them easily. This is what the pattern surplus looked like before I started organizing. Piled up in a “Head Man Cabbage” box. I needed to get organized. The first problem was actually physically storing the patterns. I liked having them separated by decade, since I often want to look through details or ideas for a particular time period. I also find it helpful to separate them by type of garment to a certain extent. Some types of garments also don’t vary as much by decade, and made sense as smaller mini collections. So I decided to create two collections per decade, one for dresses and one for separates. I also created separate collections for more specialty garments, such as lingerie. So, I have one box for lingerie, one box for 1940s dresses, one box for 1940s separates, etc. Physically storing the patterns was another issue. I’d never been satisfied with my little ikea boxes. The patterns never exactly fit right, and would often fall down and get crushed on the bottom. Plus, many old patterns had torn envelopes that patterns would spill out of, creating a huge mess and lots of tearing. I hit upon a great solution: comic book storage! 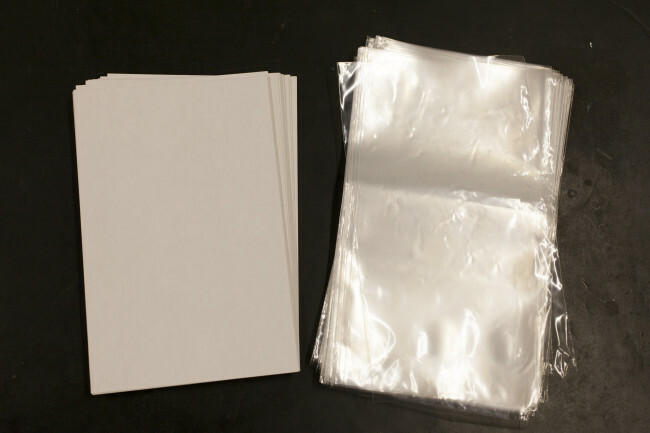 I bought bundles of comic book protection sleeves, backing boards, storage boxes, and dividers. 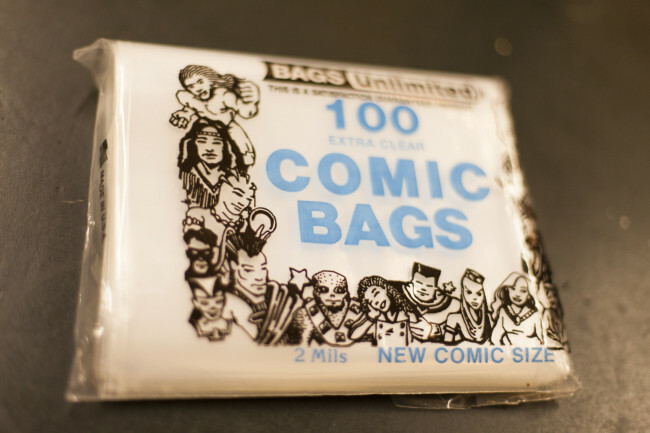 I got mine from Bags Unlimited online, but your local comic shop may have some or all of these supplies. 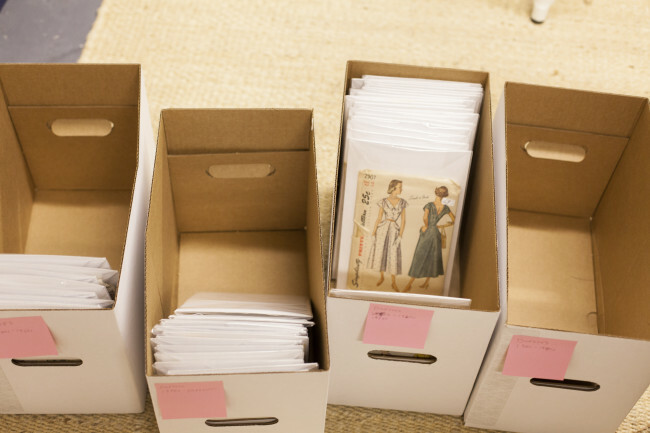 The great thing is that the boxes are the exact right size to accommodate the sleeves and backing boards, creating an instant filing system that’s easy to flip through. The sleeves hold all the standard size sewing patterns, with room to spare in case you have trouble getting all the pattern pieces back into the envelope. The boxes are simple white cardboard, nothing flashy or beautiful. You can surely jazz them up with paint or even perhaps cover them with fabric, but I’ve left mine plain for now. If anyone has ideas about labeling them or making them look pretty, I’m all ears! I ran out of steam after organizing and haven’t prettified the boxes yet. I could have stopped there. 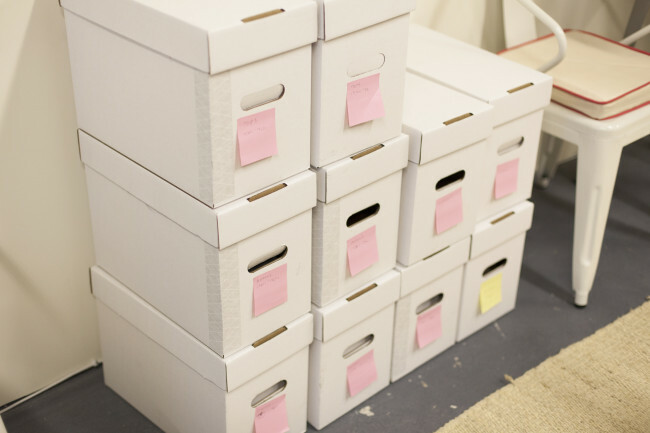 The comic book filing system meets about 75% of my needs, and really would be good enough for most people’s collections. Search. When I had the thought that I wanted a 1970s shirtdress, I wanted to be able to do a quick search and know exactly what I had and where to find it. Access. When I’m at the fabric store and see the perfect pale pink silk, I wanted to be able to instantly find out if I had a 1930s tap pant pattern I could use it for. I had to be able to access the collection from anywhere. Both of these pointed me towards some sort of mobile app. But I didn’t know of anything specifically for sewing patterns (which is a pretty niche use case, I must admit). But I thought there certainly must be people who organize other types of collections on their phones, such as DVDs, games, or even comics! So I started looking into database apps. I found an app called Tap Forms that pretty much fit the bill. ETA: Read the comments below for more suggestions. Android users might try Memento Database. In each database, you can set the fields you want for each item. For example, for my sewing pattern collection, I set fields for decade, garment type, and other attributes. You can then search by these later on. After you search, you can view a particular pattern and see all the detail you entered. I also included a field for location, so I can note which box it’s in and where to find the pattern. 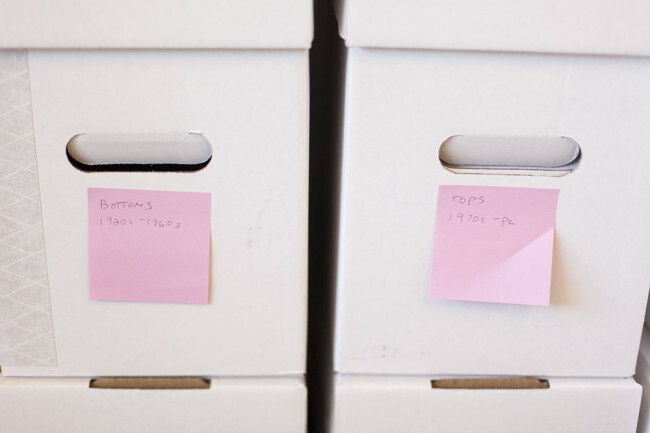 This is perfect, because I never have to worry about overlap in my filing system. 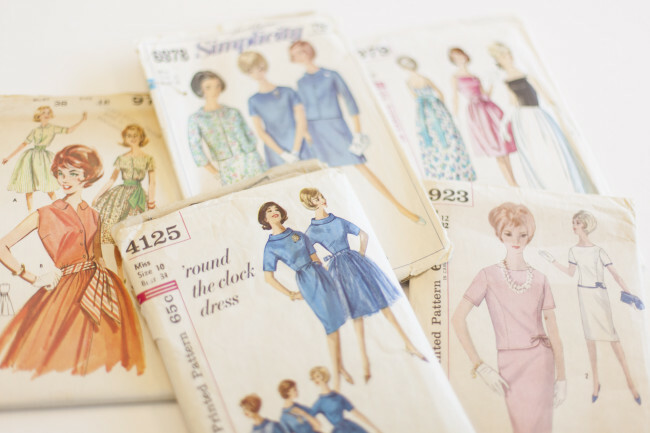 If I have a 1950s pattern that includes both a jacket and a dress, I don’t have to worry that much about whether I should file it in the 1950s separates box, or the 1950s dresses box. Either box I put it in, I’ll have the location in my phone when I look it up. It also means I can easily find the oversize patterns that don’t fit in the boxes, such as the old vogue designer patterns, or some of the indie patterns I have. You can even take a picture with your phone and add it to the database. I included a photo of the front and back cover for each pattern. This means that when I’m at the fabric store and find that perfect piece of silk, with a tap of my phone I can look at the back of the pattern and find out exactly how much of it I need. Isn’t technology incredible? You can even mark certain patterns as favorites, making them even easier to find. Of course, all this organizing did take quite some time. I’d estimate I spent my evenings for about a week tagging, labeling, and filing the hundreds of patterns I have in my collection. But once the initial work is done, adding a new pattern to the collection is dead simple. I just open up the app, create an entry, snap a couple photos with my phone, and file it away. Much better than wads of crumpled tissue and patterns going unused. What do you think about this system? If you have any questions, just let me know! I’m happy to answer them if I can. Wow. Just wow. Serious case of pattern stash envy here! What a great idea. 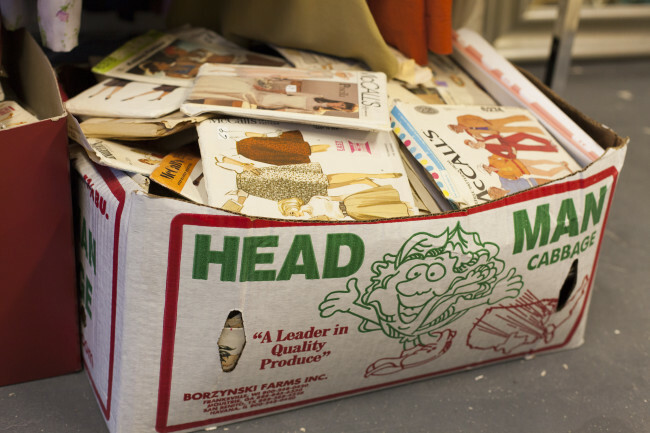 You’ve inspired me to organize my vintage patterns (I have five bank boxes full and they all look like your “cabbage man” picture. I did the same search for an android equivalent and came up with the same result! It’s already installed and I’ve been creating a database with all the fields I need. It’s also cool cuz it allows you to sync with Google Docs though you need to buy the pro version to sync more than two databases. Prior to this, I would just go through my saved photos to figure out what I owned. I could see using an app like this very useful for fabric organization as well. Thanks guys, I added a note to the post for android users to direct them to this app. Love your work! 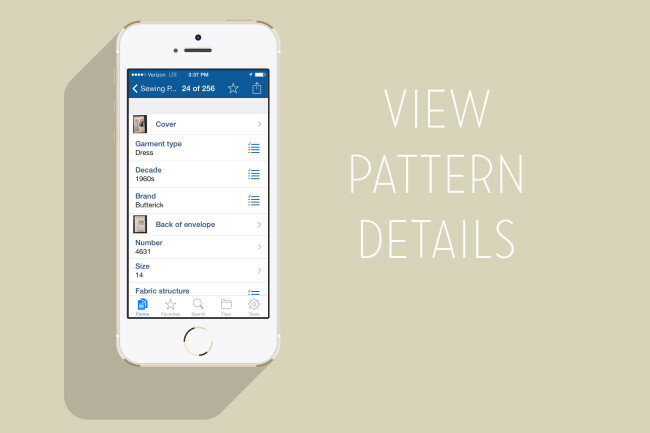 The Pattern File app is specifically for cataloging sewing patterns! It even pre fills the cover and line art, pattern description and other details of most big 4 patterns. Even vintage ones will show up if another user has entered it! Not affiliated, just a happy user! I am downloading your app recommendation to try now, Sarah… Thanks! This is really genius. I’m starting to develop quite the stash of patterns (both self drafted and bought) and I’ve been trying to figure out a good way to store them in a way that’s easy to find the particular pattern I want to use. Thank you-tank you-thank you. You are awesome. Comic book boxes!!! There is also Pattern Pal app, but it does take forever to input the data. Absolutely LOVE the comic book storage idea! This is so useful, thank you! I’ve tried to store them in some ring binder but it doesn’t work, I’ll download that app! Thanks for these tips, especially the app! I can’t tell you how many apps I checked and tried for cataloging my patterns – and I only have a fraction of your amount! Those white boxes look so neat and easy to check (oh how I’d love to get a look inside them!). Brilliant use of the comic book boxes and boards. I use the boards for mini fabric bolts too. The tap form app sounds brilliant as well and very useful for all sorts of collections! That is brilliant. I am going to copy you!! Great idea with the comic book storage – it never crossed my mind that comic book storage would be about the right size for pattern storage. As an android user, I use Evernote for keeping track of my pattern stash. It’s easy to snap pics of older patterns, and I use Evernote’s browser clipper to grab info on newer patterns directly off websites. Evernote uses a tagging system, so I tag away with type, style, sizes, etc. to make it easy to find things later. Definitely the best part – which you mention – is being able to look up yardages and notions lists while at the store. Definitely! I use a diferent system (which I’ll share at some point soon) because I like using swatches so I can feel the fabric. But I’m starting to think some sort of hybrid approach might be good. Please do! I’ve been contemplating the best way to inventory my fabrics for a while, ideally some sort of swatch organization. Any ideas would be much appreciated! Awesome! 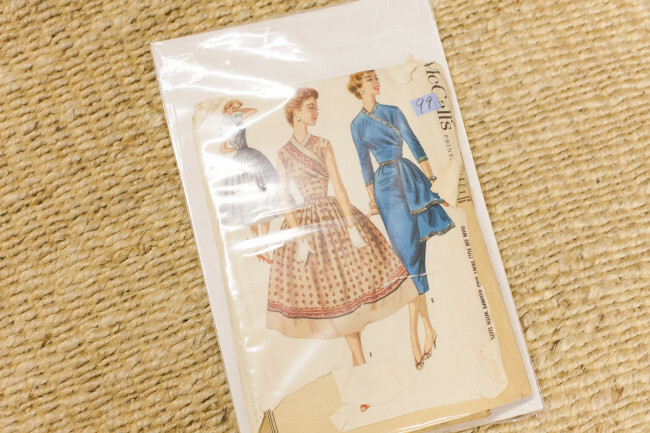 When I order vintage patterns they come in those plastic sleeves with the piece of cardboard. I’ve always thought it was a genius way to store patterns. Glad to know where to get the sleeves now! LOL! Mustn’t let him see. Disguise them as …comic books! This is great! I have a very, very thorough pattern database on my computer, but it does me no good when I’m not at home–I’ve been meaning to find something comparable that will work on a phone. Of course I’m an Android user, though… Still, it’s nice to see (from your post and the comments) that there are options. Very clever! I love this idea, especially the phone app! This is genius. Even though I don’t have a smart phone I can see the benefits. 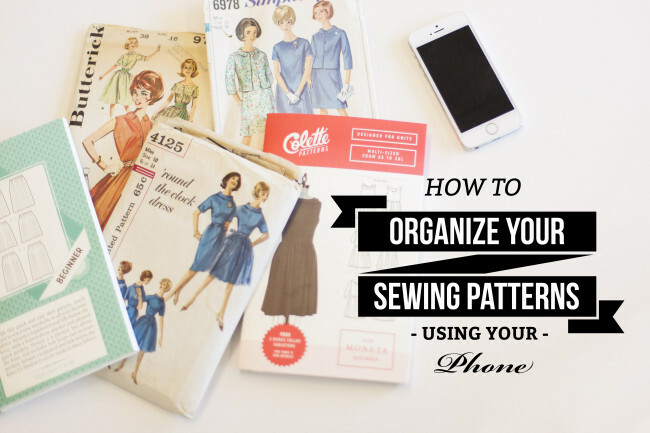 If I had all of my patterns on my phone I wouldn’t have to call my husband from the fabric store to have him check my patterns :) I will think about organizing my patterns this way though. As far as beautifying your boxes you could buy some pretty wallpaper from Spoonflower and cut the wallpaper to fit your boxes and apply with some regular Elmer’s glue. Wall paper or contact paper would be nice. They even make large sheets of duct tape that could be applied easily without glue. Thank you for the filing tips! I thought about contact paper, but was afraid I’d make a mess of the corners. I also thought about fabric, but I’m not sure if it would work well with the lids. Hmm. Ooh, I know! Find a stencil you like and stencil the boxes! It could just be a single motif that you apply once to each side or in a pattern or whatever! I love this comic box idea. The sleeves + boards thing is something I’ve been meaning to do for a while, thanks for reminding me! I had started an analog organization system for my vintage patterns but never got too far. I’ll definitely look into that suggested android app. For physical storage/organization I’ve found that once I have an external system for consulting a pattern I can just sort them by number (and not even maker +number, just number). That makes finding one when I want to use it super easy. I also keep a wishlist on pinterest so I always have something handy for those pattern sales. Brilliant! But I have a question. Is all the tap form data, especially photos, stored directly on your phone, or does your phone access it in Dropbox? I wouldn’t have room on my phone for all that info. It’s full of music! I agree, mind blown. I have a small collection of vintage patterns (two from 1898). But I have a much larger collection of modern patterns. I currently keep them divided by type but this will now end. Doing this! I will take in all the tips stated here. YAY! Brilliant! Thanks for sharing that app — this librarian is all about search and access. So lovely and organized! I have a similar system for storing my patterns. I put the pattern pieces and instructions in large envelopes, which are sorted into pattern file boxes by pattern number. Then I put the envelopes in page protectors, stored in 3-ring binders. 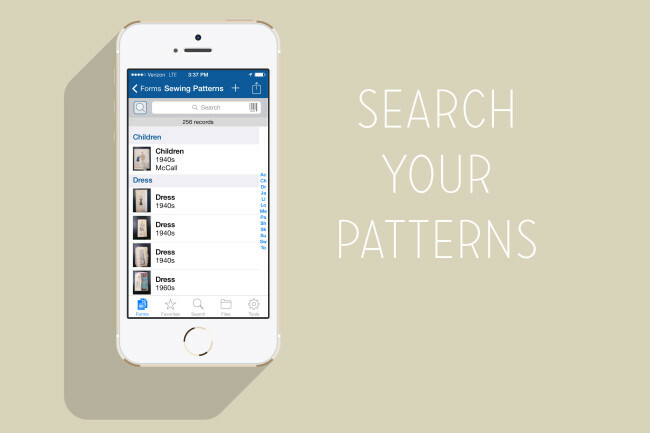 It makes it easy to sort the patterns by type and to flip through looking for the perfect one. If I’ve got a fabric in mind for a particular pattern, I cut a swatch of it, staple it to a piece of paper, and put that in the page protector for the pattern. There is obviously no room for details, but it was much quicker! I use a database app to track all my patterns, projects, fabric, and notions, and it works great for me. I also use it to track costs and time spent on each project. The one I use is Bento, now discontinued, but it let me set it up on the computer and just sync info to my phone. It looks like Tap Forms has a desktop version, which would make setting it up MUCH easier. Evernote also has desktop and phone versions, and crosses mac/windows, iphone/android, I think. I’m a big fan of evernote and use it for lots of things! I think I prefer the structured data of a database, but I could see why evernote would be great too, depending on your needs! Absolutely amazing. This fulfills two of my greatest obsessions – sewing and organising! I love it. I use an app called Sewing Kit. It’s less expensive than pattern file but does have line art and yardages for some patterns. I mostly need to know yardages so if it doesn’t have it I just take a picture and it has a place to add the pictures. 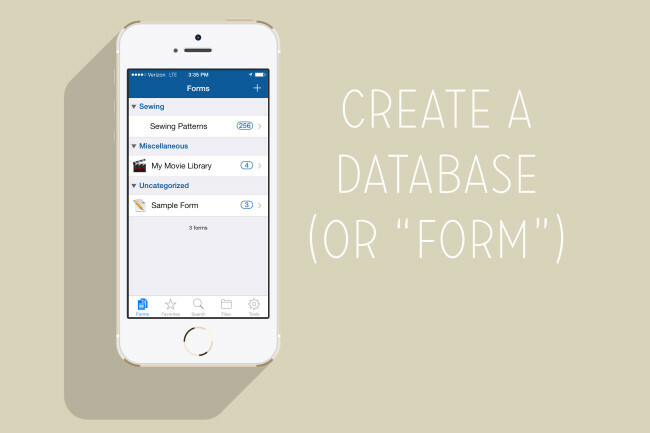 I made a similar database on tap forms too and also created one for all of my sewing projects. I had issues syncing the data from my Mac and between my devices. I ended up splurging on FileMaker though I am not convinced it was worth the outlay. Nice to see someone else digitally cataloging patterns too. I have an app called Sewing Kit. You can upload pattern pictures, and if it’s a big 4 pattern you can scan the barcode and it will download the info for you. There’s also loads of other bits you can use, including fabrics, notions, books, people even! It’s a godsend for when I’m abroad and picking up stuff – my ipad goes everywhere with me. Whatever did we do without them? 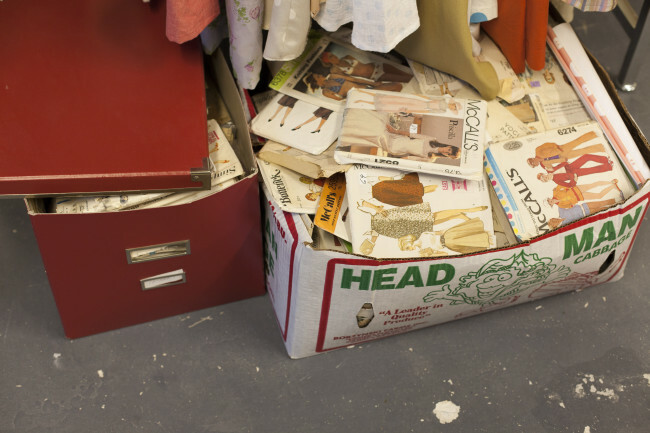 Fantastic idea – I too have a stack of patterns that need filing and cataloging. Well done you! Love your idea for the comic book storage. I have tried many different specific pattern and fabric apps to organise all my fabric and patterns most have failed as they are either too slow, crash, only allow one image per pattern or are limited with ability to change preference (I live in Australia so we use metric). I would however like to know how you stop pests such as silver fish from eating your patterns and fabric, would prefer non-toxic options. Oh, I have recently discovered the miracle that is diatomaceous earth! I live in an older house, and have found silverfish in my closets and lower cupboards. You can get food-grade DE, and it is totally non-toxic and safe for pets and kids. You can sprinkle it in your boxes and it should keep them at bay. I puff it in the little crack between my baseboard and floor, and haven’t had any problems since. And I don’t have to worry about my kitty sniffing around anything hazardous. I have been using comic book boxes too (the long ones) for several years. They are the perfect size for most patterns. I had my pattern database on Bento, but since it’s been discontinued I can’t put it on my new iPad. Thank you, Sarai, for suggesting Tap Forms. I’m hoping I can export my Bento database and not have to redo my whole system. Yay! I don’t have many paper patterns (unfortunately they are impossible to find in Portugal and hard to find in Europe…) but I have lots of fabrics and notions and this sistem would be perfect to organize them. I’ve been using Evernote to catalogue my patterns, I copy the information directly from the pattern website or use a pic for vintage patterns. It’s so handy to have when you’re out shopping. I use tags as key words for searching, either size, style, garment type or fabric type. Pretty savvy! I don’t think I can figure out how to use my smart phone that way! My patterns are divided by type, the instructions and pattern pieces are in ziplocks and filed by number in plastic bins. The envelopes are in a loose leaf notebook by style. So I can look up the yardage, notions, and fabric suggestions easily. But I do have to make a list by hand for shopping. I’m tempted to get my kids to show me how to get the app. HMMMMM!! What a wonderful idea, and thank you for sharing it. Your timing is also fantastic. I have a lot of beads/stones and pearls to organize, and you’ve given me some ideas. Fabulous ideas! Thanks so much for sharing the details. I’ve been using the Memento Database for Android and it is an absolute life saver. I’m in the habit of only buying fabric when I know exactly what I’m going to use it for (saves money and fabric waste) so I needed to be able to go through my pattern stash easily when shopping for fabrics. In the database I list the fabric yardage required for my size, notions etc. for all of my sewing patterns by category. Oh, Brilliant! Thanks for the idea. I don’t have so many sewing patterns yet. I’m mostly a knitter, and those always fit nicely into a PDF so almost everything is organized in the cloud for me. I also have just started organizing using Evernote. The plus is that it is cross platform. I have a pc, ipad and android tablet and phone. 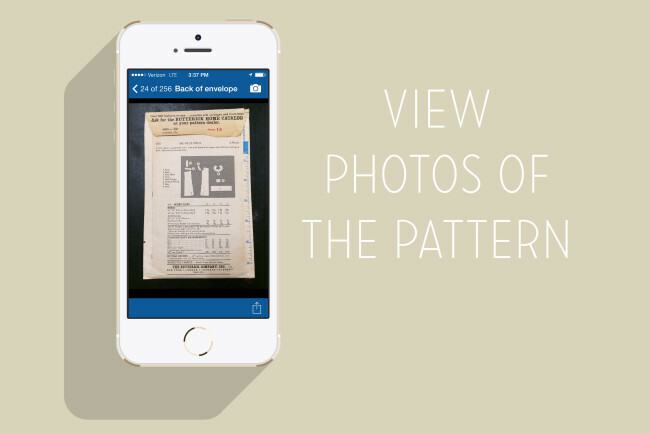 You can clip current pattern info from the web, or take photos or scan with a scan snap scanner for readable pdf’s. I have entered my projects (in process) as well as planned projects, I have also entered in some of my fabrics and sewing library. I also can store downloaded e-patterns here as well. The tags can link all together. It lets me “work” on sewing planning even when I am not at home in my sewing room. I love the app idea! I have been adding them to pinterest which I look at from my phone, but I only have the front of the patterns which is no good for when looking for the amount of fabric needed. I like the app idea so much better. This is AWESOME. I don’t have tons of patterns, but I do have tons of fabric in my stash, and I often forget what I already have. I bet this app would work for my fabric stash as well. What a brilliant solution to organising your pattern collection. I don’t have that many patterns to warrant a database (maybe one day). I have a notebook with details of my favourite patterns and take this with me when I go fabric shopping. This is a great idea! Now I just need to find… okay, MAKE the time to do it. Between these 2 resources, there’s nothing to hold me back from spending our entire retirement savings in fabric stores! I use Evernote which organizes my whole life. I’ve slowly started a notebook of patterns, especially the pdf patterns that tend to get lost between the different computers in my digital life. I keep each filed in an evernote Note with the PDF file, my notes on the pattern and a picture of my completed project. I can search by tags or within the pdf if you go premium. I know I sound like an Evernote commercial, but I LOVE this program. It is good for recipes too. Fantastic idea! I’ve been storing my vintage patterns in large plastic snap bags but probably don’t have the quantity to start a data base but maybe one day! I use a similar system. However, I get the half sized file boxes from office max. They run 12.99 for a six pack. Perfect size for both regular size patterns and the Vogue large designer patterns. I also use an excel document to organize. But I did download the android app. Thanks for the tips. OMG this is AWESOME!!! I’ve got about 20 pattern boxes of quilt patterns and this is DEFINITELY the answer to being able to find things and not duplicate purchases. Now to figure out how to do a similar thing for my .pdf patterns. Oh and also you can attach pictures of stash fabric that could possibly work on that pattern! This is brilliant – thanks so much for sharing! Don’t know if you saw the recent issue of Threads magazine, July 2014 Issue #173, but on page 86, the Q&A, have you seen the first question and answer regarding Vintage pattern preservation. Might get some helpful tips, or not! Just passing it along! Thanks for such a great post, until now I had managed to keep my sewing obsession and my database fixation separate, but this post was inspiring. I’m using Memento database too with my Android phone. I found a sewing patterns template in the list and modified it to suit what I need. But will have to pay for the Pro version as the ads drive me nuts. GENIUS! Thank you for sharing!! For labels: I like the precut, different shape peel n stick chalk board labels. You can get chalk pens to write on them. Then, in the future, should you change your mind, you can reuse them. Thanks for the info on comic book sleeves. I own a quilt shop and L O V E vintage sewing EVERYTHING!!!! This is brilliant, thank you! Yesterday I went and bought a hundred comic covers and backboards, and a couple of comic boxes,; I’m going to need to go back for more, but I’m delighted to start getting my patterns out of the plastic boxes I had them in (which weren’t quite the right size, and where the patterns were stacked on top of each other; not great for searching through them, and there was always the risk of damaging the more delicate envelopes) and into more user-friendly and protective storage! Now I just need to find the time to sort and catalogue them all! I recently just plugged all my pattern info into Evernote. I put each pattern as it’s own note, and tagged them all accordingly. Super searchable! Also… very free :). Highly recommend it. I freaking LOVE this post.. I have been nothing but inspired since I first read it. I have been googling comic bags and boards ready for the patterns and have downloaded the Android app and started customising a database to suit my needs. The only bad thing that has come from this is the realisation I may in fact have way to many patterns. Also that with all the excitement of sharing this organising goodness with my husband – he now also realises I have waaaayyy too many patterns. Any other Omnifocus users?? I love it because I can also record yardages. So when I shop the designer remnant pile at my local store, I can search by what projects are feasible with, say 1-3/8 yards of double knit. Wonderful idea! 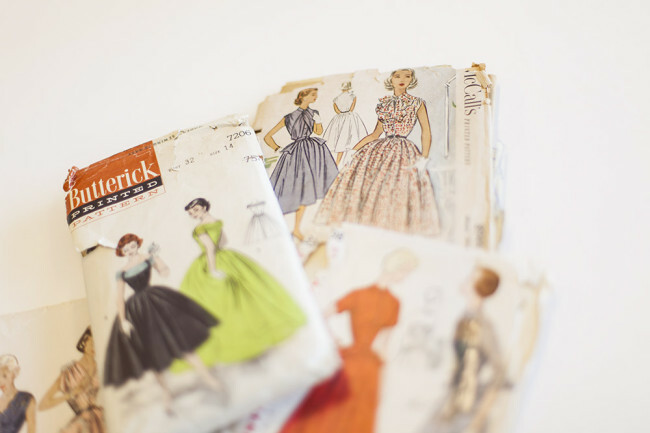 I’ve just been taking pictures of my vintage patterns to store on my phone. Combine the database with the Fabric Converter app that I already use (not affiliated with them – I can’t convert yardage in my head!) and I’ll be set at the store. Wondering if the partner will be stealing comic book boxes for his storage needs! Amazing idea! Thanks. I would like to share such a great idea with some my friends too. They would like it. Lovely organizational skills. I like what you’ve done. After buying two of the same pattern twice, I knew I had to do something as well. Not as elaborate as yours but then I don’t do period stuff, at least not on purpose. I have a spreadsheet listing all my patterns, their description, which drawer they are in, the items I have made from them & the date. I could print it out and take it with me but usually I just find a lovely piece of fabric, hold it up against me and guesstimate the amount I need. I’ve not ever been wrong, yet! The link to Memento Database is incorrect (it takes you to a recipe for pasta primavera that may well be worth trying). For Android users like me, http://mementodatabase.com/ might be more helpful. Also, Collette, I don’t know you, and I’ve only read a few of your posts, but I love you love you madly. I’d give you three thumbs up if I had a third thumb to use. Haha, thanks for mentioning that. I fixed the link in the post. My boxes are old coffee pod shipping boxes and not very good, but they work for now. I needed a quick visual method to tell me which box to look in so I labeled with different colored scrapbooking paper. Blue label is always bottoms ( light blue vintage, dark blue current) tops are always yellow (same light, dark clarification) and dresses are always pink. I don’t have enough patterns that it ever worried me to separate by decade, but that will be next. If I need to I can write further information on the label but I haven’t needed to so far. I love the unified look of the white boxes and will replace my old ones as money allows. I also love the bag and back board idea. I tend to rifle through my patterns at about 3 am when I can’t sleep and they get awfully crumpled that way. Thanks for the link! I’ve been looking for something just like this. All the pre-made ones I’ve looked at are just not providing the entry items I need. Being totally customize-able is just perfect, if it is as user-friendly as you say!